1881 1d Lilac, 16 Dot, SG 172. Two Control 'X' STRIPS OF THREE WITH 'X' INVERTRED, SPEC KL53A BUT NOT LISTED ON THE PERF CONTROL. Lightly mounted mint. 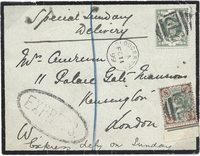 1887 4d Green & Brown, SG 205. A very fine unmounted mint Block of Four. 1900 1/- Green & Carmine, SG 214, Wmk Crown, Perf 14. An unmounted mint example. 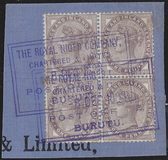 1887 9d Dull Purple & Bright Blue, SG 209, Spec K38(2). Superb Unmounted Mint. 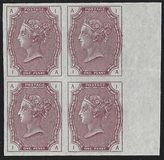 1881 2½d Blue, SG 157, Plate 21, Lettered S-J. Very fine mounted mint. 1862 9d Bistre, SG 86wi. 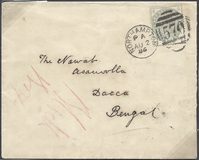 A very fine used example with WATERMARK INVERTED. Cat £700. 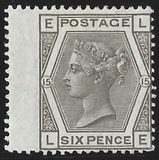 1876 6d Grey, SG 147, Plate 15, lettered I-L. A very fine, lightly mounted mint example. 1887 2½d Purple/Blue, SG 201. 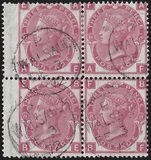 A very fine mint block of NINE with 'R&C' Perfin. 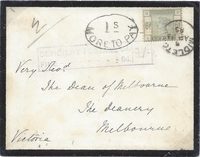 1881 2½d Blue, SG 157, Plate 23, lettered R-L. A lightly mounted mint example.